What is “Apps for websites” Feature in Windows 10? Microsoft added “Apps for websites” to Windows 10 with the Anniversary Update. This feature allows installed apps to take over when you visit their associated website. For example, when you visit a Groove Music web page in Edge, Chrome, or another browser, the Groove Music app can pop up and take it from there. For example, when you click to play an audio file on a website, you would expect it to be played in your browser, right? 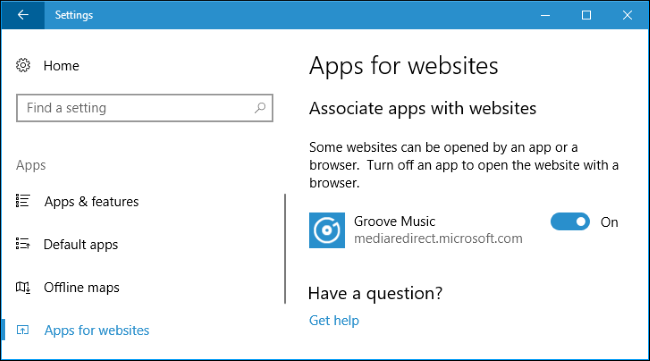 However, in Windows 10 you can use the feature called “Apps for websites” to enable, for instance, the Groove Music app to play audio files from the internet, instead of opening them with your browser. Unfortunately, like many other features in Windows 10 very few apps are taking advantage of this feature. In fact, in Windows 10’s default installation, only the Groove Music app uses it. Microsoft hasn’t bothered adding support for this feature to its other apps. To get more apps that support this feature, you have to first install them from the Windows Store. If the app is associated with a website, it will appear under Apps for websites and will be automatically enabled. Open Start Menu > Apps > Apps for websites to see a list of apps and the web addresses they’re associated with. If an app is set to “On”, it’s associated with a website and will try to take over when you visit that website. Set it to “Off” if you don’t want to be prompted to open that app when you visit the associated website. To test how this feature works visit mediaredirect.microsoft.com website. Groove Music’s album web pages are located on this domain. 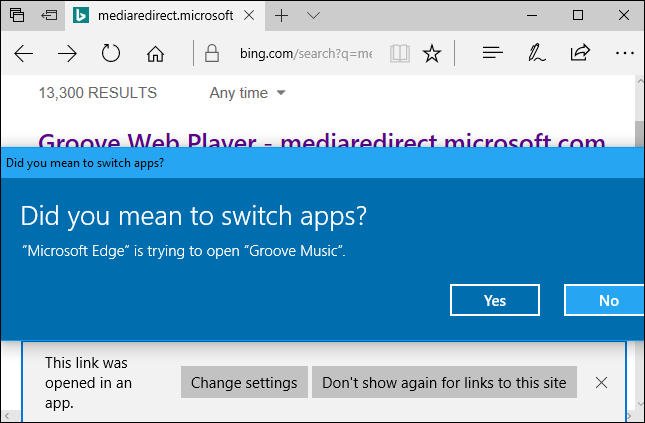 Assuming you have Groove Music installed and enabled, in Microsoft Edge, you’ll be asked “Did you mean to switch apps?” and be informed the browser is trying to open an app. You’ll then be taken to the appropriate page in the app. So, with Groove Music, you’ll be taken to the album page you clicked on—but in the app, not your browser. This feature also works in other browsers, not just Microsoft Edge.